Guy Pearce has continued to defy being pigeonholed into a stereotype and as a result, his career has been peppered by a range of characters with motivations ranging from the good to the ill-advised but none have been as deplorable as his role as The Reverend in Brimstone. Pearce is the leader of a group of Dutch ex-patriots and religious zealots who left the motherland and settled in the United States, following a calling to create a new branch of Christianity which is pure and free of the corruption. We first meet him in the opening scenes of Brimstone as he arrives as the new pastor for a small community where Liz (Dakota Fanning) is a practicing midwife and from the moment she sets eyes on him, it's clear this man is someone to be feared. It will take nearly an hour before writer/director Martin Koolhoven reveals any of the mystery and even then, it's not clear how all of the puzzle pieces fit together. And so Brimstone relies on the strength of the performances, the drama and the mystery which slowly unfolds in order to keep the audience interested and it does so rather brilliantly. Pierce is a formidably terrifying from the first moment we see him and Fanning, for her part, is quietly terrified. She plays a mute woman and her performance, mostly through facial expression and the occasional line of sign language, is very good but Brimstone really shines on the strength of the supporting performances of which there are many beginning with William Houston as Liz's husband and later on, with the mini "Game of Thrones" reunion of Carice van Houten and Kit Harington who is rather good as an outlaw cowboy - complete with a solid accent. As with other films featuring fractured timelines, Brimstone is best seen with little knowledge of the story as Koolhoven very purposefully edits the film to reveal key information in small doses making the film's final chapter that much more powerful. Present throughout are themes of religious oppression, survival and perhaps most potent, the idea of women as self-reliant and resilient. Brimstone is also not without violence, much of it emotional but also a few moments of gruesome physical violence and Koolhoven doesn't shy away from any of it though he knows just how much to show and what to leave off screen. 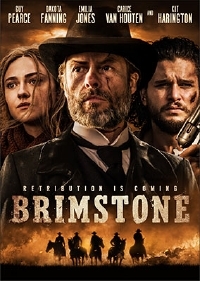 Some may find Brimstone's running time tedious but those who appreciate a well-told story which challenges the viewer at nearly every turn will not be disappointed by Koolhoven's film which straddles both the western genre while also being a tightly woven thriller. Brimstone opens in selected theatres and is available on VOD and digital HD on March 10.